2015-04-02 The on-line solver is working again! This website provides information about Nonogram logic puzzles, and how to solve them. 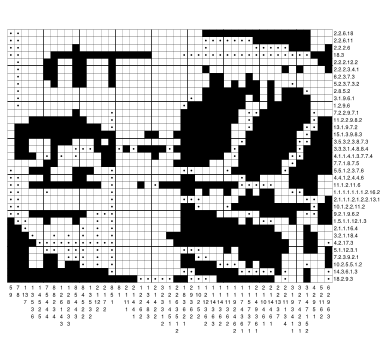 Some example puzzles are provided, and an automatic solver program is available both on-line, and as downloadable software. The on-line solver can also be used to make blank grids for you to print out and try yourself. Nonograms are known by many synonyms, for example: Griddler, Japanese Crossword, Hanjie, Pikurosu, Logigraphe, IllustLogic, Oekaki, Nemonemo Logic, Picross, StarPic, FigurePic, PictureLogic, CrossPix, Pictograph, Shady Puzzle. Solve a Nonogram automatically using CGI. Solve a Nonogram automatically using Java. Create and test your own puzzles. The name “Nonogram” and puzzle design and concept are apparently the copyright of James Dalgety and Non Ishida. Ĉi tiu paĝo disponeblas ĉi-lingve, laŭ la agordo de via krozilo.